All that optimism from the earlier speakers has gotten us excited. Not so fast…wait til you hear the message of the next speaker. Earlier this summer I heard Kentaro Toyama speak to a room full of international development practitioners who work with the United States Agency for International Development in Washington, DC. You know the experts – they flooded Kosovo in the early days after the war. In 2014 USAID jumped on the tech bandwagon and launched the Global Development Lab to harness science, technology, innovation and partnership to accelerate development impact. 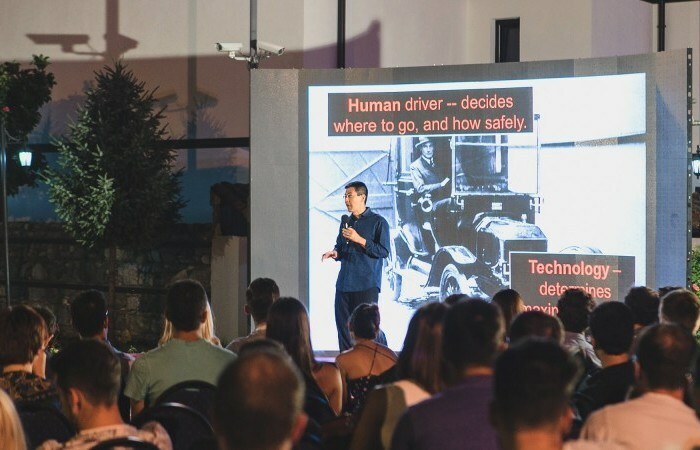 Kentaro’s message to USAID captured in his new book, Geek Heresy, in his experience technological utopianism is false – it is not possible for technology alone to solve all the worlds problems. Don’t believe the hype! After 12 years at Microsoft Kentaro moved to India to start up a Microsoft research lab. While many of their projects worked in the research context they rarely worked in the real world. The ones that worked depended on the partner – if they had a focused, capable, strong partner the project worked. If the partner was focused on something else or was weak then the project failed. Technology amplifies underlying human capacities – the positive or negative is amplified. If the government is corrupt no matter how many tools for digital transparency you implement the government remains corrupt. Kentaro offered some thoughts for us about how to realize the promise of technology. In his experience the promise of technology is realized through the increased capacities and qualities of the individuals who are using the technology. Future of Star Trek: The Next Generation – Captain Picard, We work to better ourselves and the rest of humanity. We have to get technology use right to realize the future of Star Trek.